World Cup Fever: Salud, Mexico! Did you sip on a little Fernet and Coke while watching the Argentina World Cup Game? This week we are continuing with our World Cup series with a nod to our neighbors to the south – Mexico. Everyone knows that tequila is the prized liquor of Mexico, and most Americans equate tequila with margaritas. However, we are not featuring a margarita for our tribute to Mexico. The origin of the margarita is debatable, but it is more popular with Americans than most Mexicans. Mexicans prefer premium tequilas and like to sip their tequila neat — plain with no mixers. We are featuring a popular Mexican cocktail called the Paloma. The Paloma is an easy, tasty and fresh drink made with grapefruit soda, lime juice and tequila. It is easy to see why this refreshing beverage is so popular in Mexico. The Paloma is made with three ingredients, tequila, lime juice and grapefruit soda. We made ours with our favorite tequila, Corralejo, Q grapefruit soda and fresh squeezed lime juice. We have used Q drinks in the past as mixers for our guests, but have not shared it with you on our blog. Q drinks makes a variety of mixers, such as, tonic water, soda water, grapefruit soda and ginger beer. Their philosophy is to make sure that the mixer you use is as good as the liquor you are mixing it with. We have noticed a difference in our cocktails when we use Q drinks. The drinks have more flavor and a better taste profile. Q drinks can be found at Total Wine and other liquor stores. If you do not want to try grapefruit soda with your Paloma, you can also use Squirt or Jarritos grapefruit soda, which can be found in most grocery stores. Serve a refreshing Paloma this summer. It is extremely hot across the United States this week, so what could be better than sipping on a cool beverage like the Paloma? Change things up a bit and serve a refreshing Paloma at your next summer social. We would love to hear about it if you do. Have a great weekend! Disclaimer: Beverages shared on this site are intended for adults 21 years of age and older. We do not condone underage drinking, and never drink and drive. This week was the summer solstice which officially ushered in Summer. There are many reasons that we love Summer. One reason is that it is filled with countless cookouts, family reunions, and casual get-togethers with friends. We never want to show up empty-handed for these casual occasions. Of course, Craig is always popular because he can supply a beverage or two, but we like to show our appreciation to the host and hostess with other treats, too. Rhonda snipped this recipe from the Dallas Morning News about a year ago during their annual bake off competition. We adapted the recipe submitted by Rex Poland of Dallas, and just recently had time to try it. When you show up at the family reunion with this sweet treat, you will be the favorite cousin for sure! The ingredients are mostly basic things that you have in your pantry or fridge – unsalted butter, semi-sweet baking chocolate bars (we used Ghirardelli chocolate) , eggs, sugar, cream cheese, freshly grated orange zest, and heavy cream. You will need some Kerrygold Irish Cream and Cointreau for the spirit in the Spirited Chocolate Orange Bars. There is one ingredient that was a bit tricky for us to find – plain chocolate cookies, such as Nabisco Famous Chocolate Wafers. We did not find these on the cookie aisle. With some help from our handy dandy Kroger manager, we discovered that they are kept near the ice cream sundae supplies on the baking aisle. The recipe is easy to follow but has several steps. First you crush the cookies and melted butter in a food processor. Then you press the crust in a 8 X 12 inch baking pan and refrigerate for 30 minutes. Next melt the chocolate in a microwave and set aside. Beat eggs and sugar in a mixing bowl. In a separate bowl beat cream cheese. Then beat the egg mixture into the cream cheese. Divide the cream cheese mixture in two bowls. Stir in melted chocolate into the one bowl of cream cheese mixture. In the other bowl of cream cheese add orange zest and Cointreau. Gently pour each mixture over the cookie base and swirl gently with a spatula. Bake about 25 minutes. Turn off the oven and cool with the door ajar to room temperature. While the bars are cooling, prepare the ganache. Melt semi-sweet chocolate in the microwave. Heat heavy cream to a hot temperature. Combine the cream and melted chocolate, and 1 ounce of Kerrygold Irish Cream stirring until smooth. Spread ganache over the top of the cooled bars and refrigerate for 3 hours. When ready to serve cut the bars into squares and serve. If you are viewing this post in an email, visit our site for a printable version of the recipe. This recipe has a few extra steps, but the final outcome is definitely worth it. The chocolate and orange flavors compliment each other nicely for a tasty treat. Will you bring Spirited Chocolate Orange Bars to your next casual gathering? June Bonus Post: Fernet About It! It’s time for another Blind Pig Blog bonus post. We continue our series to celebrate The World Cup by raising our glass to the country of Argentina. Argentina is known for its amazing soccer teams and one of the world’s most beloved and famous players — Lionel Messi. While watching The Cup, we drink as the Argentinians do by sipping on a Fernet and Coke, which has been rumored to be one of Messi’s favs! Fernet Branca is an all natural aromatic bitter or amaro. Its highly herbal aroma and flavor comes from over 40 herbs, spices and roots which are gathered from 4 continents. Aloe ferox, chamomile, angelica, and saffron are just a few of the herbs and spices that make this unusual bitter. The original recipe was created in Italy in 1845, by Bernardino Branca and the family recipe is still a closely guarded secret to this day. Bartenders and mixologists love Fernet. It is so popular within the service industry that it is called “The Bartender’s Handshake.” If you offer to do a shot of Fernet with the bartender, you will be fast friends. The Argentinians love to drink a splash of Fernet with their Coca-Cola. In fact, they like it so much that Fernet Branca built its only distillery outside of Milan in Argentina. The strong flavor of the Fernet with its medicinal taste is not for everyone, but it is a taste that one can acquire. The sweetness of Coke or Diet Coke definitely helps. To make a Fernet and Coke you fill a rocks glass with ice. Add an ounce and half of Fernet Branca. Top off the glass with Coke and enjoy. Watching the World Cup this week? Craig will definitely be watching and sipping on his favorite spirit — Fernet Branca. Give a Fernet and Coke a try and let us know what you think! Disclaimer: The beverage on this site are meant for adults 21 years of age and older. We do not condone underage drinking, and never drink and drive. There are a few things every four years that cause business as usual to come to a halt in The Blind Pig household. You may or may not be aware that on Thursday, the 2018 World Cup commenced. Since then, soccer, or football as the rest of the world calls it, has been running on our TV almost 24/7. Craig and Blind Piglet #2 are huge soccer fans, and don’t like to miss out on any of the action. In honor of the World Cup, we are going to feature some cocktails with some World Cup flavor over the next few weeks. Since the World Cup is hosted by Russia this year, our first idea was to feature a Moscow Mule. However, we feel that has probably already been done, so we made a little twist on the Moscow Mule to create the Watermelon Mule. Whether you are a soccer fan, or your feet have never touched the pitch, the Watermelon Mule is a beverage that can be enjoyed by all. The Watermelon Mule is a great summer drink, and is easy, tasty and fresh. Add 1.5 ounces of Seagram’s Watermelon Vodka to a rocks glass or mule mug. Fill with ice. Top off with ginger beer and a squeeze of lime juice. Garnish with a wedge of watermelon and a lime. It’s refreshing. It’s tasty. It’s like summer in a mug! Now you are ready to sit back and relax in your hammock or watch a World Cup match. We hope all of our favorite dads are having a wonderful Father’s Day. We appreciate all loving fathers, and want to send a big cheers to our favs — Tom, John, Kirby, Alan, Ryan, Kregg, Chad, Todd, Chris, Jeff and Ken! We are wrapping up Negroni Week with a special beverage that makes the classical cocktail lovers happy, as well as those who prefer a drink that is less alcohol forward. In this post we are also sharing some entertaining ideas to help you plan that special guy’s day cookout or get-together. The White Negroni debuts an aperitif that is new to us called Lillet. (Lillet, pronounced “Lee- Lay”, rhymes with “hey” not “Gillette”. Rhonda mispronounced it and the kind man that works at Total Wine set her straight.) Lillet is a French aperitif wine that comes from Bordeaux, France. Oui, oui! We noticed it smelled similar to white cooking wine when we first opened the bottle. We substituted Campari in our White Negroni with Lillet to lessen the bitter taste that you can get with Campari. Since Lillet is clear colored, it gives the drink a white hue, rather than the traditional red hue of the Italian Negroni. Note to self: this drink is best stirred not shaken. To make the White Negroni you need 3/4 ounce of Malfy Con Limone Gin, 3/4 ounce Lillet Blanc, 1/2 ounce Carpano Blanco. You combine all of the ingredients in a shaker, stir and serve over ice. Use a lemon or orange twist for garnish. We chose to serve ours over a large cube of ice to give it a more sophisticated look. Since the Lillet is easier on the palate than Campari, this drink is a smoother than a typical negroni. It can please all types of cocktail lovers that you may be entertaining. Even Rhonda said that she could sip on the White Negroni! Because steaks, bacon, mac and cheese and savory cheeses pair nicely with negronis, the White Negroni or the Italian Negroni makes a great cocktail to serve your dad and guests for Father’s Day. We joined in the latest trend by pairing ours with an easy to put together meat and cheese board. Will we see you sipping on an Italian Negroni or White Negroni at your next gathering? We would love to hear about it if you do! Follow us on Instagram @theblindpigblog for other great summer drinks and Father’s Day ideas. Have a great weekend. Disclaimer: Drinks on this website are meant for adults 21 years of age and older. We do not condone underage drinking, and never drink and drive. Hey friends, June 4th kicks off National Negroni week. We have been saving our Italian Negroni just for this special occasion. “Never tried a negroni,” you say. If you are into classic cocktails, this week will be a real treat for you. Negronis are said to have come about in Florence when an Italian count suggested that the club soda in his Americano be replaced with gin. The key words in the above sentence are Italian and gin. The negroni is an Italian creation. Typically when most bartenders think of gin, they do not grab for an Italian gin. To properly bring the negroni back to its original roots, we are pairing it with an all Italian cast. In our Italian Negroni we use 3 Italian liquors: Malfy Originale Gin (We told you about Malfy Limone in the Cucumber Gin Spritz. ), Carpano Antica Vermouth (which we told you about in our Carpano Sangria recipe last summer), and Campari. The Italian Negroni is a true classic cocktail with an aggressive taste profile. This recipe is so easy to make. Pour 1 ounce of Malfi Gin, 1 ounce of Carpano Antica Vermouth, and 1 ounce of Campari into a rocks glass. Garnish with an orange peel and ice. We chose to use one of our ice spheres in our cocktail. This cocktail is a great beverage to serve dads on Father’s Day, or for a guys’ night out. Let us know if you try it out! Disclaimer: The beverages on this site are meant for adults 21 years of age and older. We do not condone underage drinking, and never drink and drive. Want The Blind Pig Blog to come straight to your inbox? Enter your email address below and you will be all set. 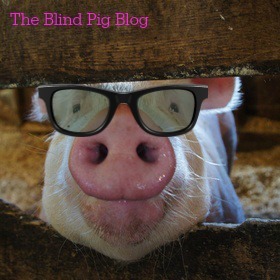 Want The Blind Pig Blog to come right to your inbox? Enter your email address to subscribe and receive notifications of new posts by email.